Starting in March, CatholicTV will premiere a new series called “Exodus” which is hosted by Rabbi Samuel Chiel. Each week, CatholicTV airs an episode of “Exodus” with Rabbi Chiel. Rabbi Chiel is the Rabbi Emeritus of Temple Emmanuel which is one of the largest Jewish congregations in Massachusetts. Rabbi Chiel is also an author. He wrote the book “The Healing Power of the Psalms”. In the new “Exodus” series, Rabbi Chiel makes common sense out of the story of Moses, Pharoah, the Israelites, and the ten commandments. Thus far, Rabbi Chiel has received positive feedback regarding his show both from Catholics and Jews alike. 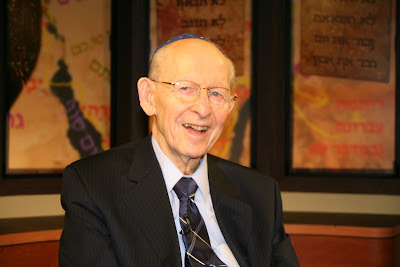 During a previous series by Rabbi Chiel on CatholicTV, viewers contacted Rabbi Chiel to thank him for the show. “One Catholic viewer contacted me for advice. I advised her regarding her job, her mother, and other issues. She was very happy to talk to me” said Rabbi Chiel. Rabbi Chiel met CatholicTV employees during a pilgrimage to Israel. The pilgrimage included both Christians and Jews. A year after the pilgrimage, someone at CatholicTV contacted Rabbi Chiel and the rest was history.